Movie adaptations of video games must be cursed. Okay, I may be exaggerating, but there’s something to say about the genre when there isn’t a single film that critics, fans, and general audiences like. You can come up with so many reasons why this is the case: some are poorly made; some are made for fans; some bastardize the source material; some video games feel like movies in the first place; some video games aren’t meant to be made into movies because there’s nothing to adapt. The odds seem stacked against the genre, and yet, it pumps out films fairly regularly, with some being lost causes looking for easy cash, and others actually wanting to prove that there is hope in making such pictures. Warcraft belongs in the latter category, and while it’s up to the challenge of being a good film, it unfortunately falls short of its mark. The film is clearly a project from the heart that ultimately sinks under the weight of adapting its lore. The orc world of Draenor is doomed, and the sinister orc warlock Gul’dan (Daniel Wu) opens a portal to the peaceful realm of Azeroth, which the orcs invade with the intention of colonizing it. Their arrival disturbs human leaders Lothar (Travis Fimmel) and King Llane (Dominic Cooper), with the latter realizing that all of Azeroth may have to unite to fight against the orcs. 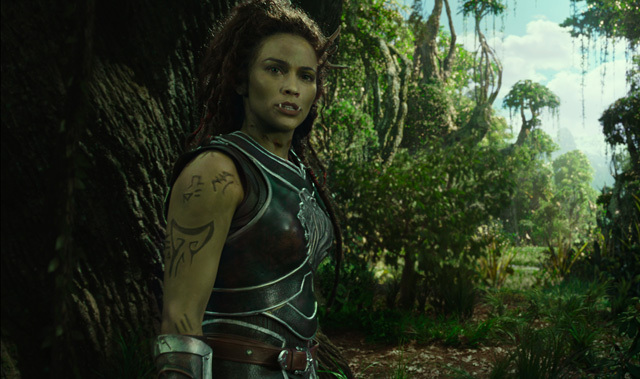 The two enlist the help of young mage Khadgar (Ben Schnetzer), archmage Medivh (Ben Foster), and half-orc/half-human Garona (Paula Patton) to combat against this newfound threat. 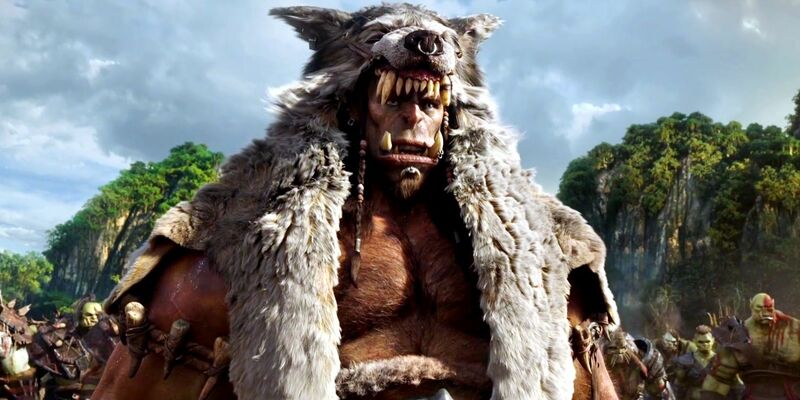 Meanwhile, noble orc chieftain Durotan (Toby Kebbell), a recent parent along with his mate Draka (Anna Galvin), suspects that war against Azeroth’s denizens is not the answer and that the true threat lies in Gul’dan and his use of the dark magic fel, which could be the reason why Draenor is dying. Against the reservations of his friend Orgrim (Robert Kazinsky), he believes that allying with Azeroth against Gul’dan may ensure the survival of all races. Now, I’m not a Warcraft fan, so I’m reviewing this from the perspective of a general moviegoer. Despite their popularity in my youth, I’ve never played the games (nor any from Blizzard, for that matter), simply because I could never get into playing role-playing and strategy games. Still, I was intrigued by director and screenwriter Duncan Jones’ (Moon, Source Code) adaptation of the material, and so decided to go with a friend and his buddies – most of whom played the games and were fans – on opening night. In the theater, I’d say that the majority of the audience consisted of fans, and within moments, I could tell that the film was made for them. The crowd ate it up, giggling and whooping at names being dropped and characters showing up. The film knows its true audience, and while it does try to simplify the proceedings for the sake of the non-fans like myself, it unabashedly wears its heart on its sleeve for those who are excited to watch this. To me, that’s simultaneously the film’s most fascinating aspect as well as the biggest hurdle that it doesn’t quite clear. There’s no doubt that this is a passion project from the heart of someone who loves and reveres the games, and it shows. From the vocabulary to the passing references, the film is so steeped in its lore that every breath it takes brings out something new. For a Warcraft fan, this is their nectar and ambrosia. As for someone who’s not, well, it’s an entirely different experience. The film throws everything but the kitchen sink at its audience, and simply put, it’s too much for anyone who’s not familiar with this world. I was able to follow the plot along for the most part since it generally kept my interest and I found the lore quite charming, but even after the film ended, I couldn’t quite remember the names of several characters and regions. I imagine that others who aren’t as invested in the story as I was will have a difficult time juggling all these worlds, regions, groups, characters, and terms. The world of Warcraft is rich with detail and history, and as the film tries to cover them all, its storytelling problems come to light. With any blockbuster movie franchise, there’s a fine line between telling a contained story and building a world, and a film’s narrative can walk that line or operate on either side. The Dark Knight trilogy focuses on telling contained stories, the Amazing Spider-Man films (especially the second one) aligned with world building, and the MCU (Marvel Cinematic Universe) generally finds a comfortable balance between those two purposes. Jones and his creative team may think that their film too walks that line, but here, world building clearly takes precedence over a contained story. Several characters – particularly the humans – reveal their backgrounds in passing comments so that the narrative can quickly proceed to whatever else seems cool, thereby rushing their arcs and not allowing us to truly emotionally invest in them. This penchant for world building is also apparent by the ending, which makes the whole picture feel like a two-hour premiere of a series as opposed to a complete film. It’s a shame, as I was having fun with the second half until I felt rather cheated by how the film resolves. The film is jam-packed with material, but near-haphazard editing prevents it from being the immersive experience that it seeks to be. Although it clocks in at a comfortable runtime, the film feels choppy and truncated, especially in the first half as characters and regions are introduced. Jumping from place to place makes juggling everything seem like a chore, and as previously mentioned, the characters’ backstories are doled out in a matter of seconds. All this complicate matters later as characters like Khadgar and Medivh undergo changes that don’t resonate as well as they should since they don’t quite register as characters in the first place. Jones has stated that the theatrical cut is almost 40 minutes shorter than his first cut, and surely that amount of material would have significantly beefed up the characters. What I’m curious to find out is whether he had final cut since the film definitely feels as though it’s missing 10 or so minutes of content. I’m not saying that the studio ultimately stepped in to cut the picture, but there seem to be whiffs of it. Jones’ efforts to tell a balanced story between the humans and orcs are admirable, though one is far more compelling than the other. It’s somewhat reminiscent of Matt Reeves’ terrific Dawn of the Planet of the Apes in that there are two storylines – well, three if you count Garona’s – at play here, but my interest heavily skewed toward the orcs and not the humans. The orc storyline is very straightforward, but its simplicity allows its themes of parenthood and leadership to truly come out and resonate. As a result, it’s engaging, and I dug the film whenever the orcs were on screen. The human storyline falls flat since it manages too many characters who have significant bearing on the plot (four as opposed to the orcs’ two), and it essentially bears the burdensome task of world building. There’s a lot going on with the human storyline, and it’s difficult to emotionally invest in it, which is compounded even further by the fact that it ultimately outweighs the orcs’ in terms of screen time. Garona’s story is certainly interesting, but the narrative never really focuses on it until the climax since that’s when she actually has agency. Prior to that, her perspective is shaped by those of the humans and orcs, which essentially places her at the mercy of predominantly male authority. Truth be told, the live-action performances are, for the most part, forgettable. The narrative and editing don’t serve the human characters and Garona very well, and as a result, the cast either has very little to work with or had their efforts whittled down to what we see on screen, which ultimately doesn’t amount to much. I would even go so far to say that some of them are miscast, like Fimmel and Schnetzer. The former plays the main human character, and he’s absolutely bland; he has no chemistry with any of his fellow cast members and doesn’t nail any of his emotional beats. The latter is unconvincing in his delivery, as most of the time he looks unsure about how to react and respond to other characters and whatever is going on around him. Cooper fares slightly better, though it helps that Llane is not in the driver’s seat as much as Lothar and Khadgar. Ruth Negga, playing Llane’s wife Lady Taria, brings a welcome sense of calm to the proceedings. Foster appears to be the only actor who understands the inherent silliness of the material, and his delightfully hammy performance reflects that. Patton is a mixed bag; she’s clearly putting forth the effort, but it’s for naught since Garona never comes into her own until the very end of the film. On the other end of the spectrum are the motion-capture performances, and they turn out to be simply stunning work. ILM (Industrial Light & Magic) has churned out some of the best special and visual effects over the decades, and here, they’ve created some incredibly beautiful orcs. When Jones frames these characters in close-up shots, the staggering amount of detail and texture – from their hair to the ridges and scars across their bodies – makes them photorealistic and a reason to watch the film in theaters. However, visual effects can only go so far for motion-capture, and that’s where the cast comes in. Some may say that such performances are really the product of artists and engineers sitting clicking and typing away at supercomputers, and there’s some truth in that sentiment. However, at the end of the day, it’s the cast that provides the movements both big and subtle (like eyes turning), speaks the dialogue, and injects these characters with personalities. Kebbell, Kazinsky, Wu, Galvin, and Clancy Brown (who plays Blackhand) are fantastic at doing all that, and their efforts make their characters engaging and full of heart. This is a picture driven by spectacle, and the craft emphasizes just that as well as scale. The flick is embedded in the fantasy genre, but it also functions as a war film. Hordes of orcs clash with human regiments, and such sequences can be either pulse-pounding or akin to watching cutscenes from a video game, depending on how they’re filmed. Cinematographer Simon Duggan’s use of wide shots to capture Azeroth’s many regions successfully imparts the awe-inspiring scope of this world and the reach of the conflict. Production designer Gavin Bocquet’s practical sets – consisting of throne rooms, lodges, and tower interiors – are sleek and fairly impressive. The humans’ armor and weapons have a sense of artificiality and sheen – likely due to the fact that they are 3-D printed – but complement the film’s half-compelling/half-silly tone. Ramin Djawadi turns in a score that balances the thunderous booms of war with softer, emotional beats. His work isn’t as epic as I expected, but given what Jones is going for with the film, it’s a good fit. Warcraft is not a good movie, as it suffers from fundamental problems that cannot be overlooked, but I don’t think it’s as atrocious as other reviews have made it out to be. I enjoyed it more than I thought I was going to, and that stems from the fact that it’s so passionately made that its heart comes out. Is it silly? Sure. But can you get caught up in its silliness? Definitely. The film stops short of being a guilty pleasure for me, but I’m interested in checking out a sequel. Perhaps that one will be good and go on to break the duck of video game movies. This entry was posted in Movies on June 15, 2016 by Jun I.